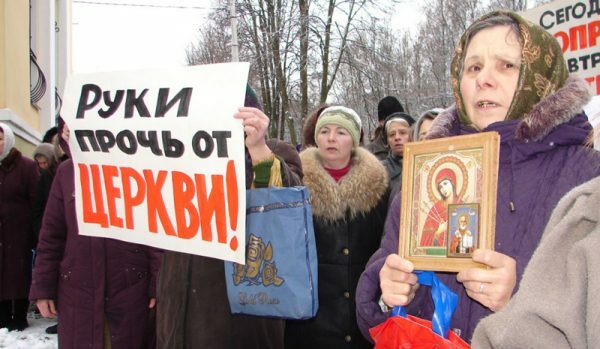 Church seizures have become a part of daily life in Ukraine since the Patriarchate of Constantinople invaded the Ukrainian Orthodox Church’s (UOC) territory, creating a parallel, schismatic structure to which it granted autocephaly. As the majority of Ukrainians desire to remain faithful to Christ in His Church, the nationalist-schismatics have had to resort to forcefully and deceitfully seizing churches. However, at the same time, the schismatics have greatly exaggerated the number of churches that have either joined or been forced to transfer to the schismatic so-called “Orthodox Church of Ukraine” (OCU). While the persecuting Ukrainian state and schismatics speak of 400-500 parishes, a new interactive map published by the Legal Department of the canonical Ukrainian Church shows that as of March 26, 62 parishes have been attacked by schismatic raiders, the majority of which are in the western part of the state. The map was first presented yesterday at the press conference “The UOC in March: Reaction of International Organizations, Lawsuits, Religious Conflicts in the Regions—Facts and Figures,” reports the Union of Orthodox Journalists. “The map … accurately reflects the real statistics of churches seized on the territory of the Ukrainian Orthodox Church. As you can see, most of the seizures occur in western Ukraine—the territories of the Volyn, Rivne, and Zhytomyr Dioceses. Clicking on an icon opens a brief description of the events leading up to the seizure of the church,” explained Archpriest Alexander Bakhov, the chairman of the Legal Department. He noted that the data on the church attacks was gathered as part of the Legal Department’s monitoring of the violations of the rights of believers of the canonical Church. At a recent meeting of the All-Ukrainian Council of Churches, His Beatitude Metropolitan Onuphry of Kiev and All Ukraine explained that 55 parishes had been seized at that time, though another 137 were also transferred by the illegitimate vote of the territorial community against the will of the parish community. The faithful of the canonical Church continue to endure persecution from their government and their fellow Ukrainians with meekness, not responding in kind.